A total of 6,324 base pairs, distributed on eight different regions of the mitochondrial DNA (mtDNA) were re-sequenced for 32 specimens of Norwegian farmed and wild Atlantic salmon. A total of 16 new and three previously reported single nucleotide polymorphisms (SNPs) were detected. These SNPs were validated using 240 farm and 119 wild Norwegian salmon. Alignments of sequences obtained in this study and previously published sequences revealed another 15 previously unreported SNPs. The panel of mitochondrial SNPs detected in the present study will, in combination with previously identified SNPs, prove useful in designing efficient assays for analyzes of mtDNA variation. We thank Salmobreed and AquaGen for providing samples from farm strains, Gunnel Østborg (NINA), Paul Berg, Arne Roseth (Cigene), and Hege Munck (Nofima) for technical assistance. 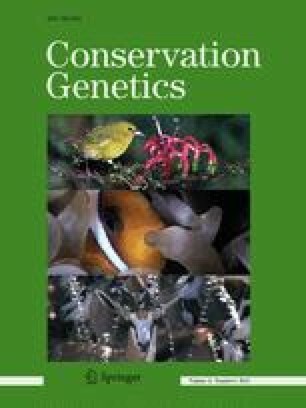 This paper is a contribution from the project “Genomics as a tool for detecting selection in farm Atlantic salmon and interactions between escaped and farmed wild salmon” funded by the Research Council of Norway (NFR FUGE grant no. 175130).